Welcome to "Our Greene Acre" and a little bit of farm life. Canning, Gardening,Crafts, Chickens and Bees, Dogs and Cats .. There is always something happening here! One of the great things about having a garden between our house and my Grandmothers was that my job was to pick options for dinner, I mean literally pick options for Dinner, digging fresh potatoes, there's a cucumber and a tomato that was just ready or greens that were calling my name. And then just as I was leaving there are the radishes, just waiting for me to pick a couple for his salad. It was a chore and an experience at the same time, one I wouldn't trade. While I'm still not a fan of radishes, there are a few fans at my house now. So late last summer when I put in beets I also put in a patch of Easter Egg Radishes. The great thing about radishes are how fast they come up. It's almost as quick a wisteria for those of you in the south, but not quite as sneaky. I had quite a haul and look at those greens! They were just towing over the poor beets that were planted at the same time! I personally picked the Easter Egg variety because I wanted the different colors and the large greens. I had recipes for both. This year I'll be planting another crop of these and maybe I'll try the Watermelon Radish, or the real name Chinese Red Meat Radish. I'm hoping they keep their green outer color and pink inner color when they are pickled. Now for the Science part! That spicy flavor of radishes is due to the chemical compounds found inside, like Glucosinolate which is also found in mustard. As I mentioned before, and as you can see in the picture, they grow very quickly and are great companion plantings for other veggies that grow a bit slower. Most pests avoid the radish greens which helps other plants like broccoli and beets. They enjoy full sun and a soft soil. Most often when you think radish you think salad, but I'm hear to tell you that they make an awesome pickle too. I use a pickling brine that is part white vinegar, and part red wine vinegar. Add a few carrots to the mix and if you like heat, slice up a jalapeno, pop it in the fridge for a couple of days and then watch out. It's a great addition to fish tacos and sandwiches. Don't throw away those greens, they make great Kimchi or just saute them if your taste buds aren't up to the heat! Overall they are a great addition to your garden, stagger the planting over a couple of weeks so that you'll have a nice long harvest. 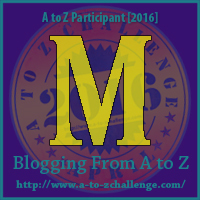 Thanks for taking this trip with me and check back soon for more of the A to Z Challenge! While they look like Carrots and they do grow in the cooler months, they aren't even from the same family. While they share a shape that is about the extent of their likeness. Parsnips can be grown well into the winter while carrots enjoy a bit more warmth in their growing season. 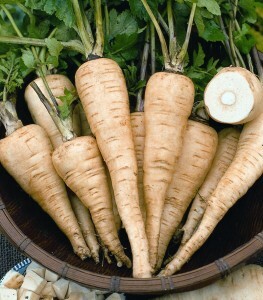 While parsnips look like a white carrot once you try one you'll know the difference. Parsnips have a spicy flavor while the carrot is sweeter, more like a squash flavor. These long growing root veggies need a deeply worked soil that is loose and free of clay and stones. They can be one of those needier plants in your garden so take heed, they will need to be weeded until they establish themselves and they like to have "wet feet" so they'll need to be watered often if the weather takes a turn towards the dry. Warmer climates will need to mulch to help keep in the moisture, this will help cut down some on the watering. As they mature they will have a vigorous green top and the root with start to push up out of the soil. Harvesting is easier than the growing, just loosen the soil around the root and pull. Cut the tops off and place the washed root in a bag for up to two months in the fridge. They also store well in the ground, wait to harvest until after the first frost, which will give them the best flavor. They are great for diets also, being very low in calories and high in vitamins. They have been used to help control blood pressure and as a diuretic when passing kidney stones. Parsnips are a great addition to your diet since the uses are very versatile. They can be baked, pureed for soups or eaten raw in salads. Parsnips can be a bit picky to grow in the garden but they are easy to find in the fall at a local farmers market near you. Go ahead and plant a row late this summer and if it doesn't work out, you can always pick then up at the market, but just give them a try, you might just be surprised! 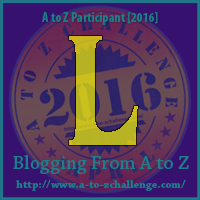 Thanks for stopping by this A to Z Challenge Post, I'll see you in the Garden! Okra is one of those things in the South that you either love or hate. But which ever side you fall on, there are things that you just don't know about it. 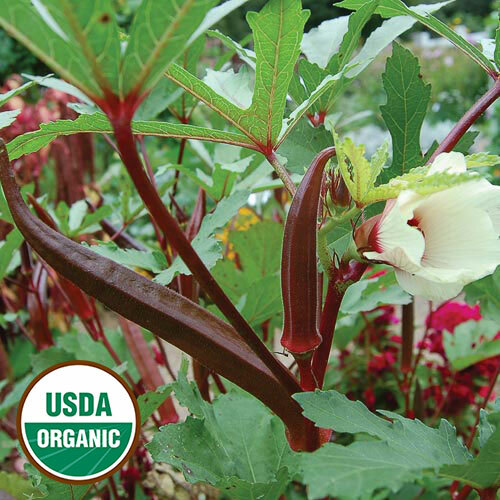 Okra originate from North African countries, and is also known as Bamia.It is related to cotton and Holly hocks, now that's a diverse family! The pods are generally harvested while they are still "green". It grows best in well drained, nitrogen rich soils. In some areas the seeds are roasted and are used as a coffee substitute. They are very low in calories and high in Vitamin A, dietary fibers, Iron and Magnesium. They are also great for women who are in child bearing years since it is very high in Folates. The plants can grow quite large, up to 6 feet in the right climates. You'll want to pick the pods while they are young and tender, generally around 4 inches in length, check your plants often they grow quickly. The older. Mature, pods become tough and woody, and have been used to make paper and rope. Woody texture is not what I think of when Okra comes to mind, slimy would be the description I would use. But that mucilaginous juice is what the prized result of cooking okra in stews and gumbo. Okra is prickly, and slimy, but it does have it redeeming qualities. If you are looking for something interested for the garden there is now a Crimson variety to go along with the green. The talk stalks have very showy blooms and heart shaped leaves and don't require much in the way of care. Check out the Seed Savers Exchange for Seeds and other information. Thanks for wandering through the garden with me, you never know you might find your new favorite recipe or at least something different to try! 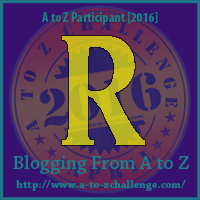 This is a delayed part of the A to Z Challenge that is happening in April. 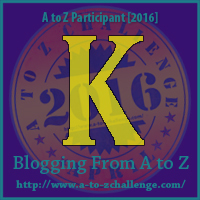 Join me and other Bloggers as we blog the Alphabet! So I'm cheating a bit but the title really sums up how I feel about this post! I'm using my N post to talk about nuts or actually nut trees that you can grow at home. Depending on where you live you have all kinds of options in what to plant and how long it will take for them to produce. Just think of planting a Nut or Fruit Tree as planting for your future or your kids future. Even small amounts of area can produce a good harvest of nuts, some can be quite profitable. And add to that general low maintenance, what's not to love! Once your stand is established the most work you'll have to do is the harvesting. The first thing to do when considering what kinds of trees to get is to have your soil tested. Then you'll need to plan for the amount of space you'll need in the future. Then is your climate correct for the trees you want? Some varieties have to have a more temperate climate such as California for Pistachio, these are E's favorites and I imagine she would try if she thought she could grow them in the green house..lol. Pecans are a staple of the south and we are lucky/unlucky enough to have 9, 7 very old and 2 relatively in tree terms younger. When we first moved into this house I was thrilled with the trees, then after a relatively busy storm season, pecans turn into missiles in high winds and the wood is soft, so be prepared for lots of downed limbs, I was a little less ecstatic. I do enjoy having pecans available at the holidays for baking and such so I guess it's worth the trade off. Plus we do crack many pounds while we watch TV and sell them at the markets around Thanksgiving and Christmas. Leaves are just coming out good on one of our pecan trees. In the first couple of years, trees like Pecans and Walnuts, have a tap root that grows downward at a rate of least 2 or 3 feet, then they can continue to grow upward up to 100 feet over many years. If you are on the West Coast of the US then you get the opportunity to grow more exotic trees like Almonds and Cashews. Almonds can be grown anywhere that peaches are grown, the only problem is that they are often effected by late frosts, so they are generally grown in the more temperate climates of California. If you aren't in the south or the west coast and still want to grow nut trees, there's still hope. As long as your area doesn't fall below 20 degrees below zero then you should be be able to grow Hazelnuts and walnuts. Nut trees don't need much in the way of pesticides or trimming other than when they are very young. You'll want to make sure that you have a straight strong trunk to ensure the tree is strong as possible. Pest such as squirrels can be thwarted by something as simple as a dog that runs the area periodically. You'll want to make sure that the orchard area is kept mowed low to help ensure there isn't competition between your trees and other shrubs for available water and resources. If you have a large or small area and some time, consider some nut trees for the future. The initial input will pay off multiple times in future harvests. 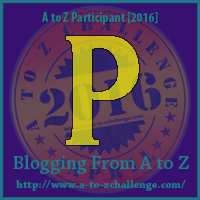 The crud has put me a bit behind but I'm going to try to finish out the A to Z Challenge before the end of the month, so post will be appearing randomly over the next week. Check back often to see what happens! One of my favorite past times as a child was watching bugs, rolly pollies,Bees, Butterflies and of course lightening bugs, fireflies for those not native to the South. Now these things that represent the warm sunny days of my childhood are disappearing from our landscape. With our love of lush green lawns, factory farms and the loss of the wild places we also loose a piece of ourselves, we are robbing our children of summer joy of watching the butterflies flit from plant to plant. Butterflies are the third most populous pollinator, so not only are they beautiful they are important to our food system. Why is are Monarchs and other pollinators dying off? Deforestation, loss of habitat and the over use of glyphosate, Round up to me and you. These days Round up is used everywhere, it's even built into our corn and soy seeds to tolerate being sprayed with it. It's used along roads and in your yard. We have become a society that doesn't understand the importance of what we now see as "weeds". One of the main plants they are seeing major loss in, is the Milkweed. Doesn't sound too bad does it, to lose a weed. What if that weed is the only plant that Monarchs Caterpillars eat? Then it's a problem! I heard that milkweed is poisonous, and you still think I should have it my garden or yard? Yes, It is very poisonous to Animals and People but it's not something that you would be harvesting or handling. It's for the caterpillars remember. And the ingestion of the plant along with the showy colors are what keeps them from being eaten by birds and other animals. It's best to plant it in an area away from normal traffic, just to be safe. Isn't it the same as a butterfly plant? No, nursery's will occasionally call it that since the word "weed" is so unpopular, if you are looking in a nursery know the scientific name for the species that will work best in your area. Milkweeds are adoptive to their environment, so you'll need one native to your area. Check out Monarch Watch for a great list of plant options for your zone. By adding a clump, you'll need more than a couple of plants, of Milkweed to your pollinator garden you'll not only be helping out the Monarchs but you'll be helping bring a species back and we must act now before it's too late. Every little garden helps. Want to learn more about Monarchs and their decline check out these sites. Thanks for stopping by I'm a bit off pace this week but working to get back on track. Lemongrass is one of those things that the naming is true. It is in the herb family but grows in a large "grassy" clump and the flavor is definitely citrus. Which leads to all kinds of uses in dishes and teas. It can be grown in the garden or in landscapes in zones 9 and warmer. If you are in cooler climates you'll want to stick with potted plant that can be brought in over winter or just as an annual. Interested in growing Lemongrass at home, it can be started from seeds or from shoots. I've found seeds available from Baker Seeds , Johnny's selected seeds and I'm sure there are other companies that carry them. You can also root the plant from stems. If you get a fresh piece go ahead and pull off the outside leaves until you have bare stem. Place it a glass with a couple of inches of water for a couple of days and you should see roots forming in no time. Small leaves will form then you can go ahead and plant in the garden or a pot. In the garden Lemon grass can grow in a clump from 3 to 5 feet tall. It is a tropical plant and needs full sun, it can be over wintered in warmer climates or kept in a pot and brought in during the cold months. It will need a moist soil, so frequent watering is best. It's generally used in Asian cuisines but the leaves can also be used to make a tea. It is high in Vitamin C, A, Magnesium and Folic Acid. Lemon Grass tea can be made by seeping one teaspoon of fresh or dried lemongrass leaves in a cup of hot water for 10 minutes. Or you can find it already made into tea bags at specialty stores. The tea has been shown to help arthritis, digestive issues and to lower cholesterol. It has a light lemon taste, unlike many herbal teas have a slightly "weedy" flavor. Check out these recipes using Lemongrass and then buy a bit extra to add to your garden! Thanks for stopping by, the crud has caught up to me, I'm blaming it on the weather and this post is a bit late but it's here Today's post is in the works an will be posted today also. So double the reading. Check back for Milkweed for the M post in the A to Z Challenge! 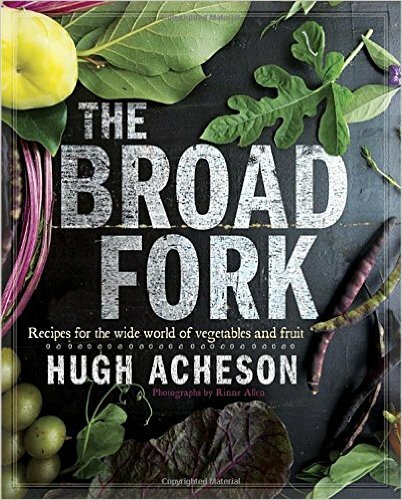 Last year I reviewed a book called The Broad Fork by Hugh Acheson and he stated in the book one of the reasons he ended up writing a Seasonal Cook Book was due to a neighbor that wanted to know what he should do with Kohlrabi. I totally understood the problem. We've been growing it for a few years and selling it at the market and we are often asked the same questions, we promise we're doing better this year giving out better recipes and calling attention to underserved veggies. What is Kohlrabi? I know it's not something that you see much of at the grocery store, much less at restaurants but if you want to add something a bit international to your family's dinner, check it out. It originated in germany and has also been referred to as a German Cabbage or a Turnip Cabbage. It is in the Brassica family, like Kale and it is also high in antioxidants and Vitamin C. While it's a strange looking veggie and it takes a bit of work to get to the best parts, it is totally worth it! The small amounts of greens that it grows are eatable, while the main part is the stem, which resembles a turnip growing above ground. The spherical stem has two layers of fibrous materials which will need to be removed since they do not soften noticeably during cooking. So what am I supposed to do with this crazy looking vegetable? That's the number one question we are posed with at the market. People are interested but just not sure what it is or what in the world to do with it. It does have a mild flavor like broccoli and is best when it's small. Large bulbs can become woody. It is a cool weather plant and most often you'll see it at the Market in late fall and Spring. Want to grow your own? It's a very undemanding plant. It grows well with beets, lettuces and Chards. In the Fall direct sow straight into the garden late August for harvest in late September early October. Some frost is fine and will even sweeten the taste some, like collards or turnips. Spring growing depends on our climate. In warmer areas start indoors up to 4 weeks before the last frost, so it can beat the heat. They are great to add color to your cool weather gardens, they come in white and purple varieties. Ok so now I have them, what do I do with them? 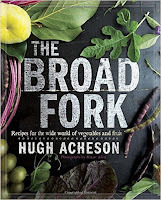 Here's a simple side dish recipe with tons of flavor from The Broad Fork. Peel the Kohlrabi and cut into 1/2 inch pieces. Melt the Butter is a sauce pan over medium high heat. When the butter has bubbled add the Kohlrabi cubes. Stir well and then add Shallot, Thyme and Celery Leaves. Reduce heat to medium and add 1/4 cup water and cover to steam. Cook until the Kohlrabi is just tender, about 6 minutes. If any water remains, remove lid so it will evaporate. Salt to taste and add Sesame seeds to garnish. Thanks for stopping by and I hope you'll give Kohlrabi a try this spring. I'm taking a turn towards Asian flavors for Thursday with Lemongrass for the L.
Leaves & Stitches – Rambling tales of a crafty, herb-y life. J for Jalapenos, Candied Jalapenos that is.. I'm talking about Garlic Again..
Brussels Sprouts for the B!